Xiaomi’s sub brand Redmi comes with another Note series smartphone after the success of Redmi Note 5 pro, they officially confirmed at the twitter handle that the new note rises on November 22 in India and it goes on sale at Black Friday sale on next day of launch November 23rd 12 noon. 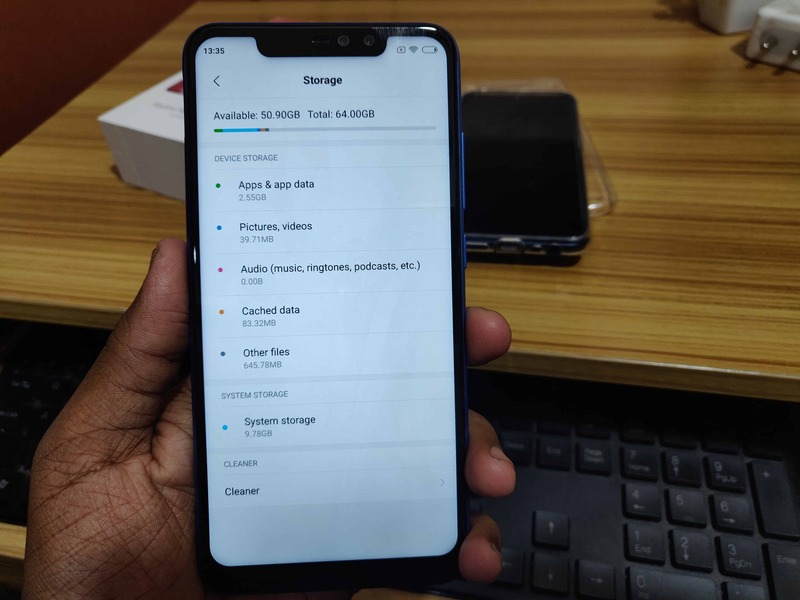 In the global version it comes in three colours variant black, rose gold & Blue with the configuration of 4GB + 64GB variant and in India launched in two variant 4GB + 64GB & 6GB + 64GB. The Redmi Note 6 Pro comes with a taller white colour box with Redmi Note 6 Pro branding along with India’s No.1 Smartphone brand tag, out of the box we have the 6.26-inch FHD Note 6 Pro in Blue colour variant with 4GB RAM & 64GB Storage configuration and a transparent protective case as like we can tell but in reality the case is not at the best in quality, then micro USB cable, charging adaptor, SIM ejector pin and manuals & warranty details. From the initial impression the smartphone looks stylish and gives premium look it has made of metal body at the back having rounded edges in all four sides and has slim design having 8.26mm depth so holding the device in hand is comfortable also, device having slighter slippery feel since its having metal body but after putting the case its safe for handling. 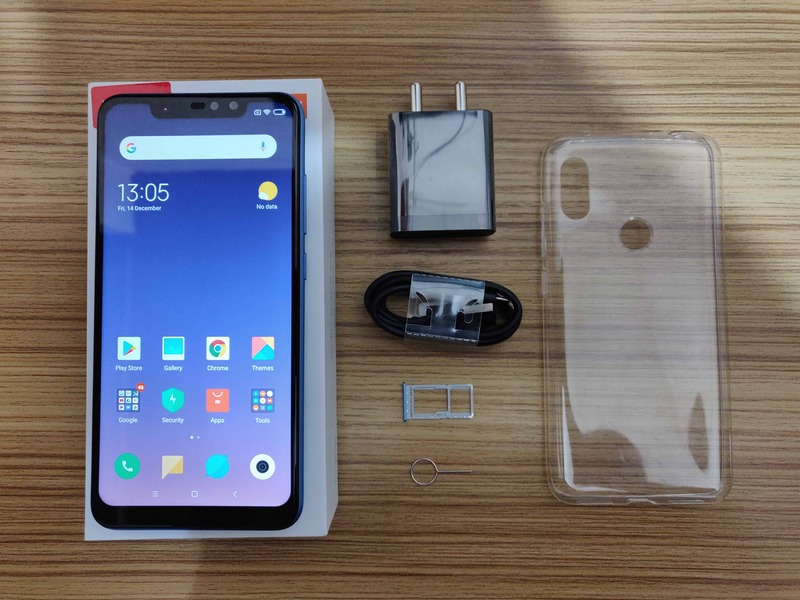 The Redmi Note 6 Pro having 3.5mm headphone jack, noise cancellation microphone and IR blaster at the device Top and in the right side has volume rockers keys & power ON/OFF button and the bottom has dual speaker grill & micro USB port for charging and in the left SIM tray is fixed has hybrid slot that you can put two Nano SIM’s or 1 SIM & 1 memory card up to 256GB, then in front within the notch dual camera setup, earpiece is placed and at the back dual camera is mounted horizontally with flash in between and finger print sensor mounted at the back and MI branding in the bottom. 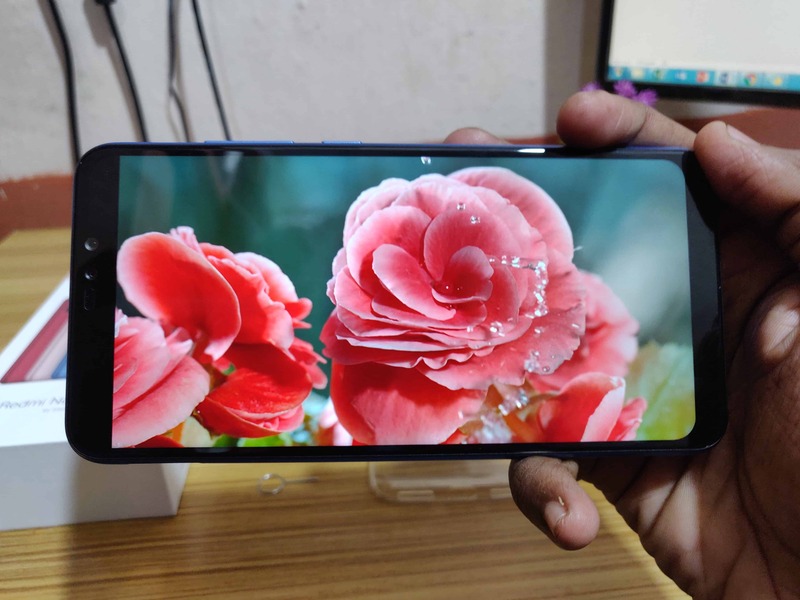 This time Xiaomi’s introduce the bigger screen size compared to the Redmi Note 5 pro the Note 6 Pro comes with 6.26-inch Full HD+ display with 19:9 aspect ratio and have a wider notch design in the top, the display has 2280*1080 resolution and 2.5D glass rounded display in all corners with Corning Gorilla glass protection and the display looks cool & premium but the notch feels like more wider this affect notification icon at the side of the notch may be hidden. For the first time Xiaomi comes with the Quad camera setup in the note series having dual front camera with primary 20MP 4 in 1 super pixel and secondary 2MP depth sensor for Bokeh effect and the front camera supports AI face Unlock, AI Portrait selfie and AI Scene detection, the rear camera has 12MP + 5MP with dual pixel auto focus technology with 27 AI Scene detection and 6 new Bokeh effects also, it supports for Electronic image stabilization for video recording. The both front & rear camera has support of portrait mode with dedicated sensor and also has support for AI based photography. See the below camera samples that are shot in Redmi Note 6 Pro in our nearby. The Redmi Note 6 Pro is powered by Qualcomm Snapdragon 636 Octo core processor with the inbuilt Adreno 509 GPU the Kyro 260 CPU used in this chip and it is an 8-core chip with a clock speed of up to 1.8 GHz and it is made 14nm process technology and this same CPU cores are used in the Snapdragon 660. The Kyro 260 is the combination of four semi custom Cortex A73 cores it works as performance cluster during playing heavy games like pubG this core supports the device to work as fast and smooth user experience and the another four semi custom A53 efficiently cores is used to save the energy & power in the device during idle time or for any lite processing this cores are activated due to that the device will manage battery capacity efficiently for long time also, it has a battery capacity of huge 4000mAh will make then device long time usage for users but it’s lack in fast charging support. 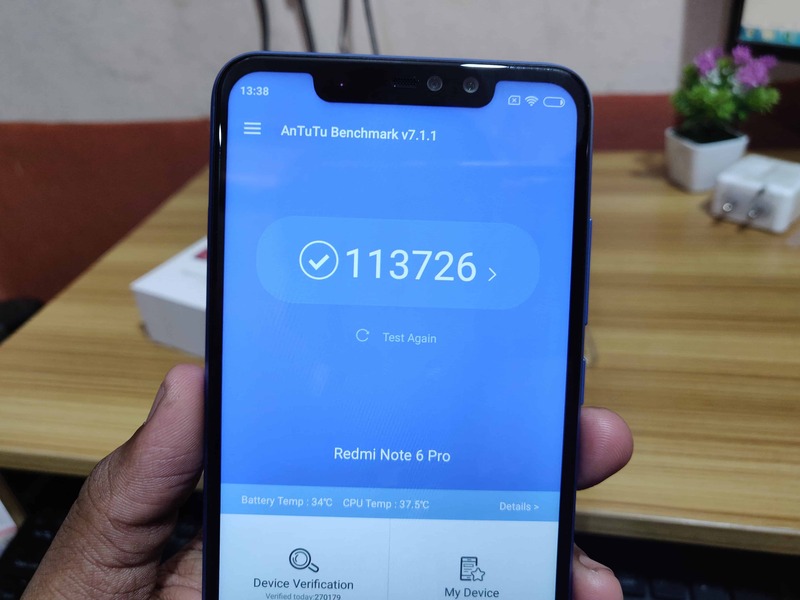 Based on AnTuTu benchmark report the Redmi Note 6 Pro scores 113726 marks in CPU, GPU, Memory, UX test and this score is less than the Realme U1, lets check in the full in-depth review soon. The device comes in two memory configuration as 4GB + 64GB & 6GB +64GB in our 4GB variant model out of 64GB internal memory we’ll get 51GB space, since it’s runs on MIUI 9 out of the box based on Android 8.1 Oreo, the device has pre-installed with applications like Facebook, Amazon, Phonepe, Netflix, Daily hunt, Opera, Jabong & Teen pathi and system applications based on MI accumulates the storage space and also you can uninstall the application that you don’t need. The Note 6 Pro has face unlock & finger print sensor for unlocking the device after testing the unlocking feature the finger print scanning is more sensitive and work faster but the face unlock is not at the best it takes more than 1 second to unlock the device, we are in testing further we check with other midrange smartphones coming at the same price and we’ll back in the review. Compared to the Redmi Note 5 pro this time Xiaomi brings Note 6 pro additionally with bigger display, Notch design, dual front camera with depth sensor, Xiaomi improved this thing in the new Note 6 pro and all other configurations are remains the same what we experience in the Note 5 pro. The Redmi Note 6 Pro available in Flipkart for the price of 4+64GB – 13,999 & 6+64 -15,999 variants.